Today, joy and tragedy. The University of Houston’s College of Engineering presents this series about the machines that make our civilization run, and the people whose ingenuity created them. It was the most unlikely of hits, reaching number one on the pop charts for four consecutive weeks in 1962. Elvis was king, and the Beatles would have their first number one single only a month later — the hysteria-inducing I Wanna Hold Your Hand. But for the moment, the public was listening to something quite different. Dominique chronicles tales of eleventh-century cleric Saint Dominic. It was written and performed by Jeanine Deckers, a Dominican sister from Belgium. Deckers played her music within the confines of her convent, but it proved so popular that the Reverend Mother gave permission to record it for Church use. Deckers recorded her music at Philips studios. She entranced studio executives, who convinced Church officials to release her music commercially under the name Sister Smile (Soeur Sourire). In the United States, she became known as the Singing Nun. Within months of the recording, the Singing Nun achieved stardom. She appeared on the Ed Sullivan show, and a romanticized movie was made about her life, starring Debbie Reynolds. But with all the recognition came problems. 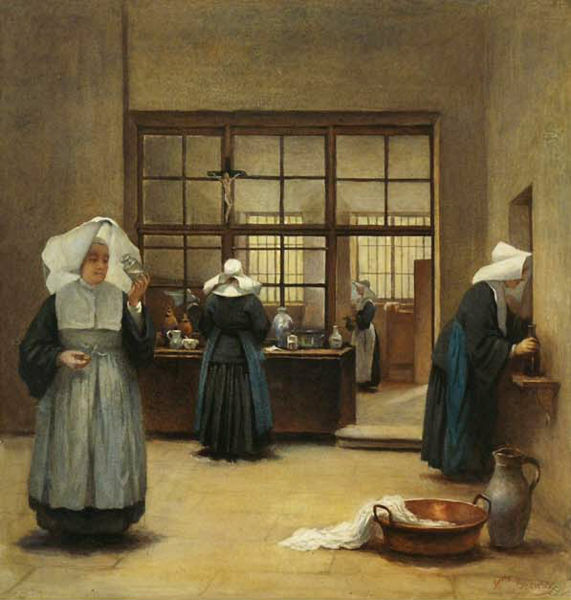 Deckers was a nun, a life entailing poverty and quiet devotion to God. The conflict ultimately proved too great for the young woman, leading her to leave the cloistered environment of the convent. Deckers remained devoutly religious, seeking to spread God’s word — and make a living — through her music. But the Church and Philips studios owned the rights to the Singing Nun, and she was barred from using any aspect of her one-time persona. On her own, Deckers was just another struggling artist. She found solace in a deep and lasting relationship with Annie Pecher. The two women adamantly maintained the relationship was platonic. But rumors flourished. Separated from the Church, her music going nowhere, and dealing with questions about her sexuality, Deckers began a long slide into depression, fueled by alcohol and prescription barbiturates. 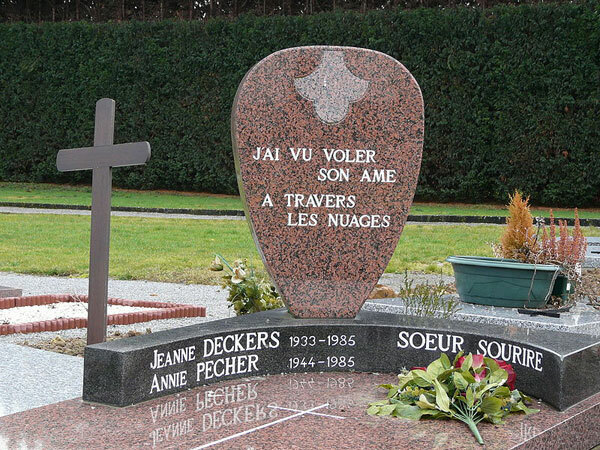 When the Belgian government sought back taxes on money she allegedly made as the Singing Nun, Deckers could no longer face the world. Together, she and Annie Pecher took their own lives in March of 1985. Deckers was fifty-one; Pecher, forty. It’s a tragic story. But amidst the tragedy was a moment of joy, as Jeanine Deckers caused us to stop and listen to her simple, heartfelt act of creativity. Limited air time always requires condensing a story. In this particular case the story was sufficiently condensed that a few cautionary notes are in order. The interactions of the many parties were very complicated and took place over many years, and no definitive account of what transpired has appeared. It is clear that all parties contributed to the tragedy; not simply the Church and Philips Studios, but Jeanine Deckers, her parents, and society’s changing norms. D. A. Chadwick. The Singing Nun: The Life and Death of Soeur Sourire. Second edition. Published on CreateSpace, 2010. The Singing Nun. From the Wikipedia Web site: http://en.wikipedia.org/wiki/The_Singing_Nun. Accessed September 7, 2010. Some excellent pictures can be found on the Web site: Soeur Sourire, The Singing Nun: http://deckers66.homestead.com/. Accessed September 7, 2010. All pictures are from Wikimedia Commons. Many pictures of Jeanine Deckers and Annie Pecher can be found on the Web. See, for example, the Web site: Soeur Sourire, The Singing Nun, http://deckers66.homestead.com/. Accessed September 7, 2010.